The incipient infinite cluster (IIC) measure is the percolation measure at criticality conditioned on the cluster of the origin to be infinite. Using the lace expansion, we construct the IIC measure for high-dimensional percolation models in three different ways, extending previous work by the second author and Jarai. We show that each construction yields the same measure, indicating that the IIC is a robust object. Furthermore, our constructions apply to spread-out versions of both finite-range and long-range percolation models. We also obtain estimates on structural properties of the IIC, such as the volume of the intersection between the IIC and Euclidean balls. Heydenreich, M, van der Hofstad, R.W, & Hulshof, W.J.T. (2013). 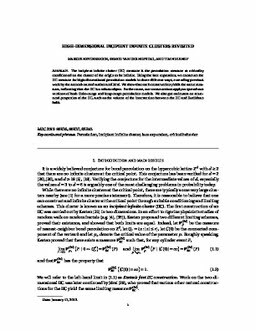 High-dimensional incipient infinite clusters revisited. Life Sciences [LS]. CWI.